Babywearing is a great way to bond with your baby and a stretchy baby wrap offers the cuddly closeness that other baby carriers don’t. I personally love stretchy baby wraps, and they were lifesavers in the earlier days while dealing with a colicky baby and trying to get him to sleep. You can do skin to skin, breastfeed, hike, or have your hands free while doing things around the house all while having your baby snuggly and close to you, but with so many stretchy baby wraps out there how do you know which one is right for you? I’ve tested out 3 different stretchy baby wraps, the Moby, Boba, and Beluga Baby. Some of them are better suited for different body types than others, but one is a clear winner for myself. Take a read and I hope you can find the right stretchy baby wrap for you! Make sure you scroll all the way to the bottom for a coupon code and to see the main rules of babywearing so that you can wear your baby safely in your chosen stretchy baby wrap. The Moby wrap comes very long and is meant to be folded in half lengthwise before wrapping it around your body. I found this to make it more difficult to wrap and feel heavier while worn when compared to the other wraps and would not be a good stretchy baby wrap to wear during the summer. That being said, I felt confident that baby was very secure when being worn in a newborn hold because baby gets tucked in between the folds so there is absolutely no way for baby to fall out. Not to say that normally babies can fall out, but it gave this FTM confidence when trying it for the first time. It is made of 2-way stretch which made it harder for me to find the right fit for baby and I. The Moby wrap is the first stretchy baby wrap I had ever tried. 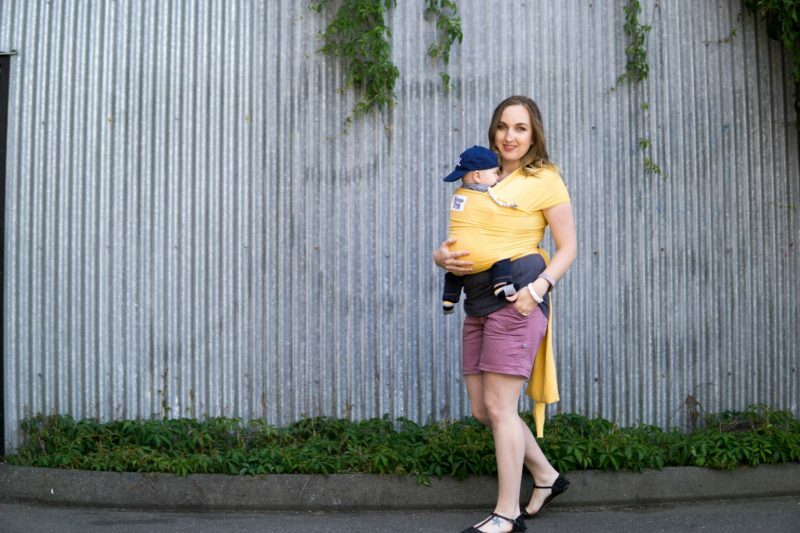 It’s how I fell in love with babywearing, but unfortunately, I did not fall in love with the wrap. The main thing that first attracted me to the Boba wrap is that it is made of 4-way stretch. I found it to feel much more secure and felt like it fit us better when compared to the Moby. The 4-way stretch really helps the wrap to mold to yours and baby’s bodies giving it a very comfortable fit. As with any wrap, it takes a few times of wearing it before you get the tightness just right, but once you do it won’t stretch out uncomfortably while wearing it. The fabric is medium weight which helps make it feel very secure, but I feel as though it would get too warm during summer months. The wrap is also very long which allows it to fit any body type, but on my smaller frame I found it to be too long and it would either be bulky when wrapped repeatedly around my waist or too long and could catch on things. I wish the Boba baby wrap would come in 2 sizes so smaller people wouldn’t have these issues and it could still fit higher sizes. Overall I was quite happy with the Boba, but I wanted to look for something lighter weight and not as long. I first discovered the Beluga Baby wrap at Bellies in Bloom and fell in love with it while exploring their products for my New Mama Gift Guide, which is great for baby shower gifts, or new mama gifting in general! It has 4-way stretch and is made out of sustainable bamboo fabric. Not only is it great for the environment, but the fabric is very soft and lightweight making it perfect for warmer months, and great for layering in colder months. Due to the lightweight nature of the wrap you really need to pull it tight when first tying it to your body. As mentioned before, it takes a few tries before you get it right. I recommend pulling it so you think it is tight enough than pulling it some more. You can check out their tutorials to make sure you get it just right. Because the wrap is so lightweight and stretchy it doesn’t need to be as long as Moby and Boba for it to fit a large assortment of sizes, which means it doesn’t need to be wrapped several times around a smaller body. The really neat thing about the Beluga Baby wrap is that on the one end of the wrap it has a square pocket. This pocket is meant to carry the wrap in a small flat package making it great for packing around in a diaper bag, but it doubles as a bonus pocket that can carry your phone or anything else you may need to be carried while wearing your stretchy baby wrap. With all of the research I’ve done for baby wearing these are the main rules to ensure you can safely babywear. It is also important to note the stretchy baby wraps are not supportive enough to wear the baby facing out. If you are wanting a different position so that baby can see more and interact more, I recommend doing a side hip position, rather than a forward facing position. For forward facing positions you want a more structured wrap like the Ergo 360 which I have been absolutely drooling over. The wrap should be worn tight around you and baby so that their spine is fully supported. If it is loose baby will slump down and not be supported properly. The top of their head should be close enough to your chin so that you can easily bend your head down to kiss your baby. Their hips need to be fully supported to avoid hip dysplasia. Their legs should be in an “M” shape so that their knees are at or above their hips by spreading the fabric between their legs from knee to knee. Their airway needs to be clear at all times. You should be able to fit two fingers between their chin and their chest. All photos were taken by local, Victoria BC photographer, Tim West. I highly recommend him if you are wanting some photos for your blog or social media. I hope the stretchy baby wrap review and rules for babywearing helped you out. If you’re interested in reading about other baby carriers please let me know in the comments below and I will do my best to help you out! Great review! This will be very helpful to new moms! Babywearing is the best! My babies and I love babywearing! It’s the only time I can do anything during the first few months! This is such a very helpful reviews for new moms! Love this review! With my new little one on the way it sounds like the baby beluga is the one for me! !